How can I create and use snapshots for BladeVPS? 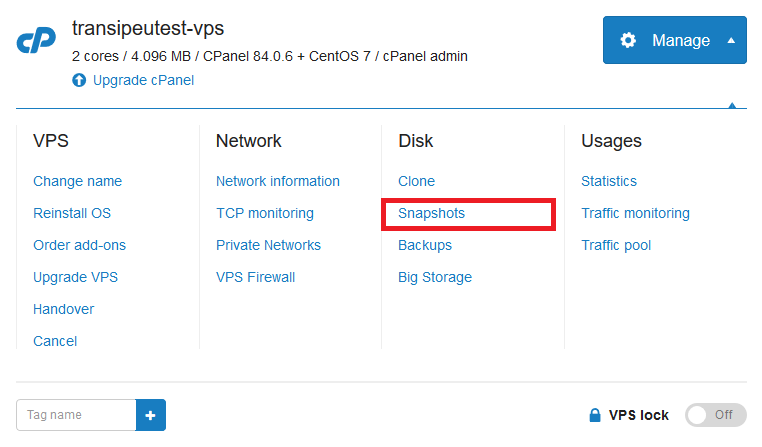 It is strongly recommended to disable the VPS before you create a Snapshot. This prevents that data which was still stored in the RAM and data that is still written during the snapshot is not included in the snapshot (with possible corruption as a result). When you take a Snapshot in the switched off state, your VPS will automatically restart after this process is complete. Please note: creating the snapshot in the off state and restarting the VPS takes only a few seconds. Creating a snapshot of a running VPS will take considerably longer. It is currently not possible to create "automatic" snapshots via the control panel (for example every day at 12 o'clock in the afternoon). However, you can create this option yourself using our API (https://api.transip.eu/docs/transip.nl/class-Transip_VpsService.html), but this does require some programming knowledge. You can also restore a snapshot on another VPS (of equivalent or better specifications), see this article for more information. The difference between a snapshot and an automatic backup is described here. Go to the 'BladeVPS' page in the control panel and click the name of the VPS on the left of which you want to take a snapshot. Click 'Manage' > 'Snapshots' on the top right. If you have not yet made a Snapshot, you can create a Snapshot here by clicking on the blue 'Create' button. You will then be given the opportunity to assign a label / name to the snapshot (especially useful if you want to use multiple snapshots). Depending on the size of the VPS and the associated disk space, it may take some time before the snapshot is created. Once the snapshot has been created, you can restore it with the 'Restore' button. Note that if you only have the default snapshot, you will first have to remove the old snapshot before you can create a new one. Should you have any questions left regarding this article, do not hesitate to contact our support department. You can reach them via the ‘Contact Us’ button at the bottom of this page. If you want to discuss this article with other users, please leave a message under 'Comments'.